Heading into this offseason, pundits seemed unable to agree whether C.J. Wilson or Yu Darvish was the most desirable pitcher available to MLB teams. While a case could be made for either hurler, they likely would've been battling for second place had Giants right-hander Matt Cain not signed a contract extension delaying his free agency by a year. Prior to the 2010 season, Cain and the Giants agreed to a three-year, $27.25MM deal that will make him a free agent after 2012, rather than 2011. The extension, Cain's second with the team, has worked out splendidly for San Francisco. The 27-year-old enjoyed arguably his best two seasons in 2010 and 2011, earning Cy Young votes for the first time while posting a 3.01 ERA, 7.2 K/9, and just 2.5 BB/9 in 66 starts. Cain will make $15MM in 2012, but if the Giants hope to keep him past next year, they'll have to commit significantly more money than that. Earlier this month, Andrew Baggarly of the San Jose Mercury News reported that the Giants figure to be aggressive in their attempts to lock up Cain before Spring Training. The club has also been said to prefer extensions of about four years, so what would a long-term deal for Cain look like? The going rate for elite arms suggests Cain could aim for $20MM+ annually on a long-term deal on the open market if he pitches well again in 2012. Baggarly spoke to an executive who thought the Landon Williams client could land a $150MM deal as a free agent, and while that prediction may be a little bullish, it's not out of the realm of possibility. 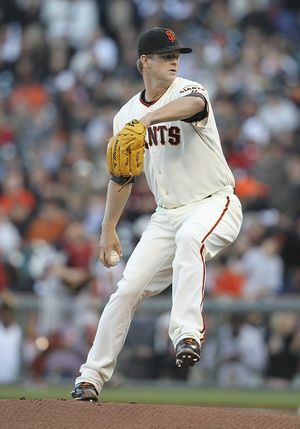 Cain will turn just 28 as the 2012 season ends, and recent marquee free agents like Cliff Lee and C.C. Sabathia signed for annual average values of about $23-24MM. Meanwhile, pitchers that signed extensions with their current teams, such as Justin Verlander, Felix Hernandez, and Roy Halladay, will make about $20MM for most of their free agent years. Although Cain may not quite be in the same company of those Cy Young winners, he certainly has a stronger track record than Wilson, whose new contract exceeds $15MM in annual average value and reportedly wasn't even his largest offer. If we assume the Giants can get Cain to agree to a four-year deal, not including 2012, they could be looking at a commitment in the neighborhood of $100MM over the next five years — $15MM for 2012, $20MM each for the next four, and maybe a $5MM buyout on a 2017 option. Cain has played it relatively safe with his previous contract extensions, so perhaps he'd pass up a chance at the open market to remain with the Giants long-term at that price. What remains to be seen, however, is whether the Giants even be willing to offer such a contract. Barry Zito still has $46MM remaining on his seven-year deal, Madison Bumgarner's cost will soon increase significantly (potentially next winter as a Super Two), and most importantly, the Giants would like to lock up two-time Cy Young winner Tim Lincecum, who could soon become the most expensive of all their starters. Given the club's struggles to produce offensively in recent years, it may not be viable to tie up so much money in the starting rotation. In his previously linked piece, Baggarly wrote that there's a "feeling around the league" San Francisco will have to part with either Cain or Lincecum at some point, rather than keeping both on long-term deals. If that's the case, perhaps the Giants will tip their hand before the season begins — each of Cain's past two extensions were inked in March, before Opening Day. 2012 $19mill , 2013 $20 mill, 2014 $7 mill buyout = $46 mill. This is right. Mistakenly counted his 2011 salary too. Fixed now. One of the most underrated pitchers in the game. When I first saw this without reading it I said my Christmas wish did come true but I guess not just yet. I really do hope the Giants lock up their pitching. It is scary that they still got to pay Zito that much but I hope they can sign Cainer and Timmy long term. I hope they give hometown discount’s haha. Easily gets a 6-7 year deal 125-150 million. Wow, then what would Hamels get? That would be awful news for the Phillies. Better redefine the meaning of ‘marginal’ then. Hamels has been superior without the benefit of pitching in a more pitching friendly park, plus being a lefty just increases his value. I believe he should be in the same range. Salaries are just rising, young, durable and can be aces or great number 2. On what other teams would Cain and Hamels not be an Ace? Giants, Phillies, Seattle, Tigers. If C.J. Wilson can get what he wants then Cain will get more. Better post-season record, abysmal run support over the years, and is a proven “horse” in terms of innings. Watched him since he came up and I hope the Giants will get something done before the offseason ends. Wilson was helped by a very weak free agent pitching market this year. Wilson is extremely underrated around here. A very good pitcher that went for a bargain of a price, given the demand for arms like his. That would be the greatest gift of all. If we can only keep one of the two I would stick with Cain, I think he can realize that if he signed before this season he could get a little security for a bit of a discount, and not lock up too much of the payroll to keep the team competitive (for Sabean to spend on over the hill free agents… but let’s not get too cynical). The real problem with Matt Cain is that the offense gives him nothing—he’s like the Felix Hernandez of the National League. A lineup doesn’t reward or punish a pitcher based on who he is or where his spot is in the rotation. Cain has a record around .500 because he tends to pitch deeper into games where the Giants: a) go ahead late or in extra innings (providing a ND), or b) fall behind by a run or two and don’t come back (providing a loss). Lincecum isn’t as stable and will pitch more shutouts or 1 run games (wins, sometimes NDs) but will have some games where he gives up some more runs and not pitch as many innings. If by a stronger track record you mean a “longer” track record then I absolutely agree with you. However, since CJ has been made a starter he has outproduced Cain. While Cain should get more than CJ (given his age) I don’t see him as an automatic $20m/year guy. If you value wins at $5m Cain would need to produce 4 WAR just to break even. In 6 seasons he has eclipsed 4 WAR just once (he had one other season right at 4 WAR). Cain’s never had a bad year but he has also never been dominant. Sabathia, Halladay and Lee aren’t in the same conversation as Cain. I would take Weaver, Verlander, and Felix over him as well. In reality CJ is actually a pretty good comp. While $15m might be a little light I could see a 6 year deal in the $17m range. That pegs his production at right under 4 WAR – which is about what Cain has produced on average over the past 5 years. I do think that “stronger” was supposed to suggest something like demonstrated success over a longer period of time. Also, that whip is noticeably better. Typically WAR is my go to number for determining value, but I think you can make the case that Cain’s value exceeds his WAR. Cain’s FIP has always been higher than his ERA, because for some reason, he’s able to keep his BAPIP lower than the typical pitcher. This is a large reason why he’s underrated, and why despite his WAR, Cain is an elite pitcher. we should get a poll going..who would you rather keep lincecum or cain? personally i like cain better long term, but its hard to see the giants not keep lincecum long term after everything hes brought them. really tough decision if its one or the other. over anyone else in the NL. Give me a guy who pitches great for 4 years rather than one or two years. That is long term. Did you just define his success by his record? Oh my. Lincecum, Fister, Maholm, Weaver, and King Felix all had worse run support. Upset cuz I didn’t say Freak instead of Lincecum? Lol, I guess using often-used, well known nicknames like Doc, King, etc. means I’m “on his nuts.” never said he was even great, just stated that he had less runs support than Cain. Just to let you know, I don’t even like like KING Felix. Not sure how many time this needs to be said, but W-L record is among the worst statistics you can use to judge a pitcher’s performance. Should a pitcher who pitches 221 innings with an ERA of 2.88 and w WHIP of 1.083 have a 12-11 record ? On any club besides the offensively impotent Giants, Cain is in the 22-5 ballpark. At every opportunity, Cain has made it clear that he wants to remain in SF long term while Lincecum’s comments lean more towards exploring free agency when he gets the chance. Given that, it’s likely that Cain will be easier to sign and willing to sign for less. Plus, and I hate to go back to this, but given their body types, Cain “looks” like he is built for a long career while you just have to wonder if/when Lincecum’s smaller frame will break down. You and Bleacher Creature are going to be great friends. It was against the rules. Nobody was enforcing them. There’s no such thing as a “bullish” contract suggestion for a 28 year old top of the rotation free agent starter…. Well have fun watching him on another team cause a 3 or 4 year deal isnt getting it done. 5 years 90M sounds about right to me. That brings his deal to 6 years 106M. He will get more than CJ Wilson, hes younger, and longer track record with great numbers, not verlander level but still possibly ace numbers or great number 2. I think he’s a very underrated pitcher, and his statistics don’t show his value. Being a fan of the Diamondbacks, I’ve seen him pitch for years, and he’s always been more effective than Lincecum. And I feel he has better pure stuff. Tim Lincecum reminds me of Dontrelle Willis, because he’s got such an erratic delivery, and was very very good during his first few years in the league. But, as we’ve seen with Willis, he began to have horrible control problems, so I think Cain is better longterm, and would cost less. Trade Lincecum for hitting, they need it! Given his age, and the fact that his ERA has been below 3.20 for the past 3 seasons (despite some hard luck) I think that he will get at least what Felix Hernandez is getting (about $16M per). 4 years and $72M total might not be too far off; both Cain and Hernandez have a great ERA but don’t have the wins to show for it. Wins don’t matter. Cain is a fantastic pitcher. I wouldn’t be surprised to see him get 5-6 years at 17-19M a year. Especially when teams like the Yankees and Red Sox will have rotation issues to resolve after this season. As a Phillies fan, I may be biased, but I think Cole is the better pitcher. If you look at peripherals, Cole’s xFIP is virtually identical to his ERA (3.39/3.42) versus Cain’s 3.35/4.26. Cain’s HR/FB ratio is 6.5%, whereas Cole’s is 11.5%, presumably a product of the ballparks they play in (which is included in xFIP). Cole’s career groundball percentage is also higher at 43.3% vs. Cain’s 37.2%, also driving xFIP. Also, worthwhile to note, when Cole had his “down” year in 2009, his BABIP was .317 and his xFIP was considerably lower than his ERA (3.63 vs. 4.32). I think he overall decline that year was the result of a World Series hangover having pitched 262 1/3 IP in 2008 (w/playoffs) after only ever pitching 190 IP (2007 w/playoffs). Cain’s career peripherals better resemble Jered Weaver’s if there’s a comparable for an extension. I think the Phils would need to offer 5/100 guaranteed now to Cole to lock him up before free agency (thanks, Kenny Williams). Personal preference. They are both good pitchers. My guess they will cost at least 120 mil. Cain dropped his ERA by .26 runs in 2011 after pitching 244 innings during the World Series year in 2010. No hangover there. Read about the Verducci effect, my friend. The relative increase for Cain was negligible. And how many NLCS and WS MVPs does Cain have? Point being, both of these guys are studs and would be a top of the rotation arm on most staffs in the majors. You unfortunately just seem to sell Cain a little short is all. The NLCS/WS MVP argument falls a little short. Edgar Renteria, Hideki Matsui, Jeff Suppan, Cody Ross, and David Eckstein were all recent postseason MVPs, are you clambering to put them on your roster right now ? Teams seem to be more inclined to try and keep their good young pitchers. I think Cain, Hamels, and Greinke will be resigned by their teams rather than go to free agency. If any of these three get to free agency the big market teams will make them rich.